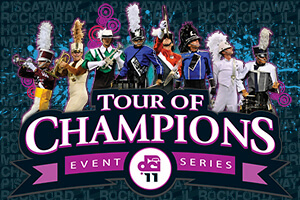 Drum Corps International's Tour of Champions event series will kick off this Sunday, July 17 in Rockford, Ill., featuring the Blue Devils, Blue Stars, Bluecoats, Cadets, Carolina Crown, Cavaliers, Phantom Regiment and Santa Clara Vanguard. The five-event showcase will give fans up-close, exclusive access to the corps performers and to exciting live entertainment. From "Instant Encores" to text-message fan-favorite voting, audience members at TOC events will be in store for a drum corps experience like never before. Joining the audience as emcees to explain all about the evening's festivities will be longtime DCI announcer Dan Potter and Santa Clara Vanguard age-out corps member Samia Mooney. Prior to the show, corps warm-ups will be closer than ever before with groups getting ready for show time right outside the stadium gates. In addition, small ensembles of corps members will be spread throughout the stadium to entertain fans as they come into the stadium and take their seats in the stands. A unique display of tradition, respect and innovation will be utilized to present the American Flag and our National Anthem. After performing their competitive productions, each corps will immediately come forward to present an "Instant Encore" of its choosing. Intermission activities will entertain fans as small corps ensembles head out into the stadium to perform. All eight corps' brass and color guard sections will come together at the end of the event to perform a rousing rendition of "Fire Dance." DCI adjudicators will trial a brand new judging system exclusively at Tour of Champions events this summer. Drum corps fans will also get to play a part in the scoring finale by text-message voting to determine the fan-favorite corps of the night.